Shrimp, Tomato, and Spinach Pasta in garlic butter sauce – a delicious Italian pasta dish with lots of fresh ingredients! 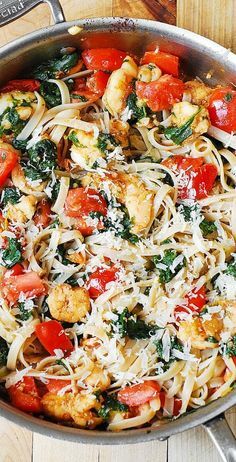 This easy garlic Shrimp tomato pasta with spinach is a great way to use up a bunch of fresh tomatoes you might have sitting around in your kitchen. Looking for a light, healthy, Mediterranean-style seafood pasta? Look no further. 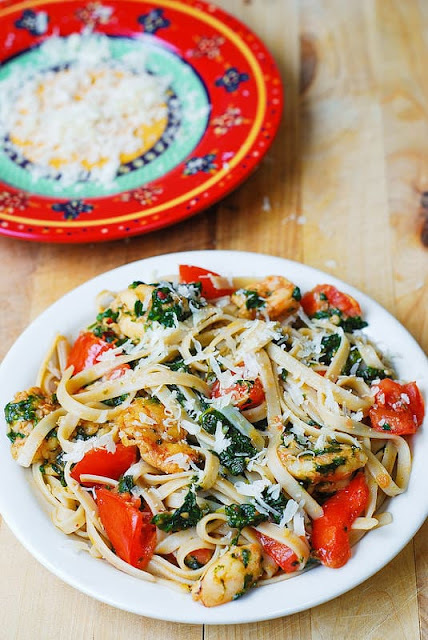 Try this Shrimp, Tomato, and Spinach Pasta in garlic butter sauce. Fettuccine pasta smothered in juices from fresh vegetables, garlic, and shrimp. Heat a large skillet on medium-high heat, add 1 tablespoon butter and 1 tablespoon olive oil until melted. Add fresh shrimp and half the minced garlic. Make sure shrimp is not crowded. Cook for 1 minute on one side until pink on that side. While it's cooking, generously sprinkle paprika and salt over uncooked side of the shrimp. Flip the shrimp over and cook for another 1 or 2 minutes until pink on the other side. 0 Response to "SHRIMP, TOMATO, AND SPINACH PASTA IN GARLIC BUTTER SAUCE"